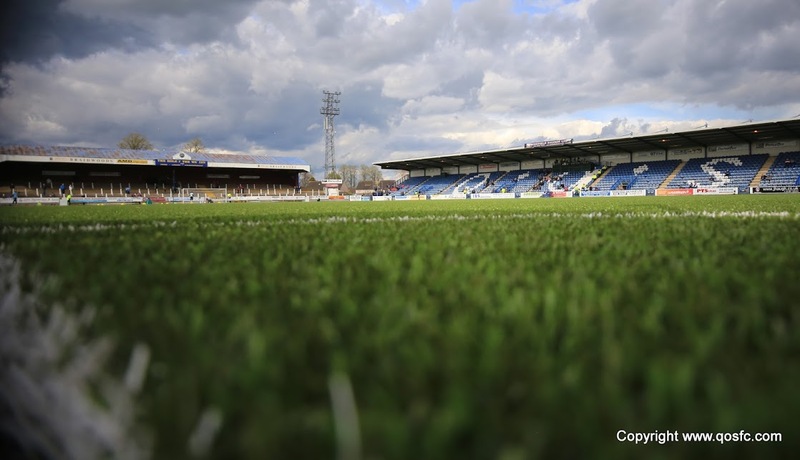 After weeks of good performances with no end product Queen of the South found their shooting boots in an emphatic 3-0 victory over Alloa Athletic at Recreation Park. In a notoriously difficult place to pick up points Queens took the lead through Iain Russell`s header after 15 minutes and did not look back as they dominated the rest of the match. Russell added his second with a superbly taken goal on 70 minutes before Gavin Reilly doubled his league tally for the season with 16 minutes left. The match began with the home side very much on top and but for some determined defending from Queens skipper Chris Higgins they could have been ahead. The centre-back cleared anything knocked into the area by the Alloa attack, most notably on 4 minutes as Alloa played in a free-kick from the halfway line onto the head of Graeme Holmes at the back post. His header back across goal was begging to be finished but for the intervention of Higgins who managed to head clear. The hosts continued to press but without managing to test Alexander Clark in the Queens goal. Queens on the other hand had been unable to make any sort of impression but were awarded a free-kick ten yards inside the Alloa half on 14 minutes. And with their first opportunity to get the ball into the Alloa box Queens made it count. Kevin Holt took the kick and drilled a low ball onto the head of Mark Durnan coming in from the right angle of the box and his header across goal was dispatched by the head of Iain Russell from 10 yards. It was a bit smash-and-grab but from then on Queens did not look back. The Doonhamers were pushing for a quick second and should have had after 21 minutes as Russell threatened once again with a headed effort. This time it came from open play as Gavin Reilly spotted the run in-behind from Ian McShane. The pass forced McShane wide but he got his head up and spotted the run of Russell at the back post. 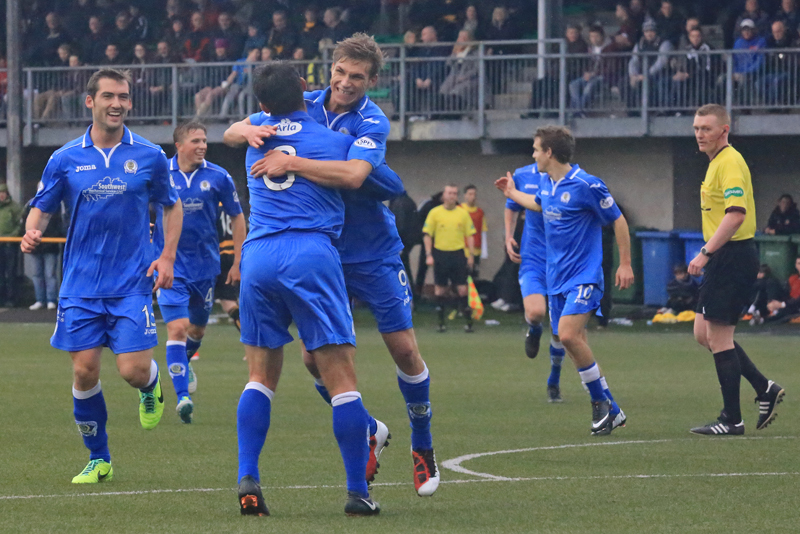 Queens` top scorer met it well with his head but Scott Bain in the Alloa goal pushed it over. Queens were playing with confidence but were forced into some desperate defending with ten minutes to go until half time as Ryan McCord found the run of Kevin Cawley ghosting in at the back post. The Alloa forward got his head to the ball and sent it toward the far corner but Clark stretched well to push it out. The danger was not over, however, as the ball fell at the feet of Andy Kirk who pushed the ball goalwards only for Chris Higgins to block the ball on the line, sending the ball behind. And it was Higgins himself at the other end who had the chance to double Queens` lead on 40 minutes as he shrugged off his marker to meet Chris Mitchell?s corner eight yards out in the centre of goal but he could only send the ball into the grateful arms of Scott Bain. Alloa had a series of corners and throw-ins in the final third as half-time drew near but the Queens defence held firm and went in at the break with a deserved lead. Alloa came out in the second half looking for an early equaliser and could have had it just two minutes into the half as Kevin Cawley ran in behind the Queens defence only to cut the ball back behind his supporting teammates. Iain Russell was still proving a real threat for the home defence though and will feel unfortunate not to have added his second on 54 minutes as he hooked Mitchell`s corner straight onto the chest of Scott Bain from five yards out. The goalkeeper can count himself lucky as he did not know anything about it. The hosts almost carved out a chance through Cawley but for Kevin Holt`s intervention before Russell doubled his and Queens` tally with a fantastic second on 70 minutes. The goal came from a real disaster for Alloa `keeper Bain as he was closed down by Gavin Reilly and in his haste to clear kicked straight to Derek Young who took his time and found Iain Russell in space on the left side of the area. Russell controlled and, as the goalkeeper flew out to meet him, stepped smartly around Bain before cutting past a desperate block by Carl Meggatt and stroked the ball past the remaining defender into the top corner. The goal showed real composure and tremendous skill as Russell netted his seventh goal of the season. That goal might have knocked the stuffing out of most teams but Alloa had the chance to reply almost immediately and this time it was Clark in the Queens goal who made an error as his attempted clearance fell to the feet of Holmes. The midfielder had only Chris Higgins to beat and he fired a half-volley toward the goal but found the head of the Queens captain giving Clark the chance to breath a sigh of relief. Alloa had another opportunity just a minute later as former Queens man Stephen Simmons smashed the ball wide from eight yards out before the three points were made safe by Gavin Reilly. The Queens youngster has struggled for goals this term but took his chance really well as Dan Carmichael played the ball to him on the stretch. Reilly stepped inside the box, stepped inside his man before looking up and finding the bottom corner. The goal capped what had been an excellent display from the Second Division champions and gave manager Jim McIntyre exactly what he has been calling for: ruthlessness at both ends of the park. 14:49 And today`s whistler is Brian Colvin assisted by flagwavers Joseph Lawson and Jim Burns. 14:54 Queens will be looking to bust themselves out of their poor run of form of late today but Alloa won`t be giving anything away. 14:55 Paul Hartley`s men have so far adapted to Championship life better than Queens have and sit in 5th place, 5pts ahead of Queens. 14:56 But saying that Queens met Alloa five times last season, winning three and losing one. 14:59 The league meetings were very tight affairs so we can expect the same today. Queens won the last meeting 2-1 here in Alloa. 2 min Queens line up in a 4-3-3 formation with Carmichael on the right and Russell on the left looking to help out Reilly through the middle. 4 min First opportunity for Alloa as they send a deep free-kick onto Flannigan`s head. He sends it across goal but Higgins is there to clear. 10 min It`s been a decent opening for the home side with Queens yet to make any sort of attack. The Queens defence have looked okay though. 18 min Queens` confidence is up and Derek Young tries his luck from 30 yards but sends it straight into Bain`s arms. 21 min It should be 2-0. Good counter from Queens as Reilly feeds McShane to cross for Russell at the back post who meets it well but Bain saves. 28 min Since the goal Queens have been in control of the contest but now they have a free-kick right on the edge of their box to defend. 29 min In the end they didn`t have to do much defending as Ryan McCord passed it straight into the Queens wall. 34 min Good save Clark! Alloa`s best chance as Cawley heads toward the top corner but Clark claws it out and somehow Higgins cleared the rebound. 40 min Another good headed chance for Queens as Higgins loses his marker in the box but heads straight at the `keeper. Should have scored. Half Time A good first half for Queens as they look in control following Russell`s headed opener. Half Time They had chances to extend the lead but go in well deserving of it. 47 min No changes from either side. 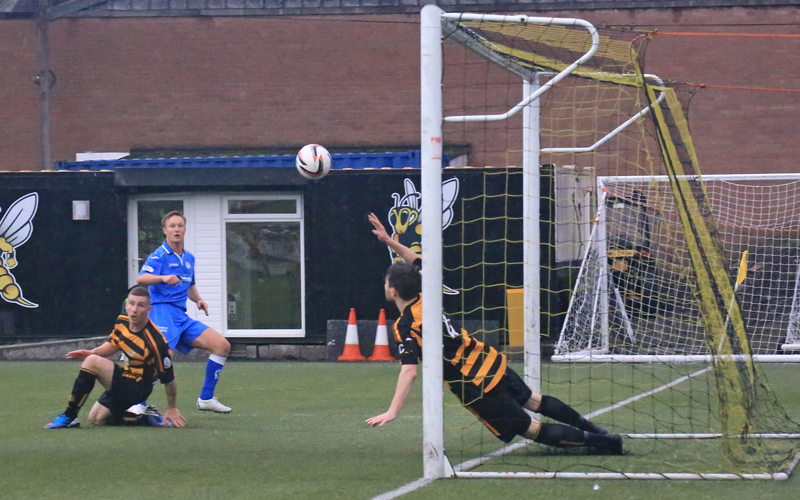 Alloa begin the half brightly as Cawley gets in behind the Queens defence but his cutback misses everyone. 54 min Good save Bain! Well, lucky anyway. Queens send in a corner from the left and Russell hooks it goalwards from 4 yards and it hits Bain. 55 min After that early Alloa chance Queens have really stepped it up and almost grab a second as Carmichael`s low cross just evades McShane. 71 min Wonderful finish from Russell. Alloa`s keeper kicks it straight to Young who gives it to Russell. He rounds the keeper and finds the net. 73 min Another big chance for Alloa! Sub McManus fights for the ball inside the Queens box and the ball drops to Simmons who smashes wide. 75 min Another good goal, this time from Reilly. Carmichael pokes the ball to Reilly inside the area, he steps inside his man and finds the corner. 80 min Chance Durnan! A simple corner from the right as Mitchell whips it onto Durnan`s head in the middle of goal but the big man heads over. 88 min Alloa look to grab a consolation from a corner but McManus heads wide. 90 min ... it comes to nothing though as Chris Mitchell smashes it off the top of the wall. 16:49 Excellent performance from Queens today with goals to go with it. Much needed win.